This was a fascinating presentation by a group of mega-church members who, in a variety of ways, have been working with house churches. Northland (Orlando), Apex Community Church (Dayton), and Austin Stone (Austin) were represented. Stew explained how Austin Stone has been planting house churches amongst the Turkish and Muslim communities in Austin. Now 100 of these are going on to Turkey to continue the process there. This is a situation where traditional, Western-style church could not have succeeded as it would not have been acceptable to the culture. They are also working amongst students on the University of Texas campus, and amongst the homeless poor and seeing real transformation. Rennes, also from Apex, explained that they are trying hard to hear what the Spirit is saying to the church. Jesus is the head. It's about relationship, we are in relationship with the Spirit (who is the Spirit of Christ). We are all led differently but by the one Spirit! Craig addressed the topic of healing. We sometimes get injured in church and big church is more anonymous so that we can remain hidden in our pain. Jesus healed people, and sometime people may need to move from mega to micro or vice versa to aid that healing. Dan from Northland spoke about resourcing the small. He made everyone laugh with his unforgettable remark that 'rabbits have teeth, please don't bite the elephant'! We need to reconnect and work together even if we have differences. They have a goal of facilitating a million house churches. They are putting useful children's ministry material online free of charge, making it available for all to use and adapt. They have the resources to do this and feel it is a useful contribution. They also run about 30 cross-cultural mission trips annually and invite anyone to join these teams. Their worship webcasts to Seminole Prison are another move of this kind. They want to connect to house churches to facilitate further networking efforts. And with Global Media Outreach (GMO) which involves Campus Crusade they invite house church volunteers to become daily prayer and email partners to help a new believer in, say, Algeria get stated with simple forms of church. Dan mentioned that we need grace towards one another, we need to accept that all of us are doing what we believe the Spirit is telling us to do. We broke into small groups to consider our presuppositions and ask whether any of them prevents us from pursuing unity. And leading on from that, to consider possible ways of pursuing unity. Neil Cole spoke about this topic. He has asked himself the question, 'What kind of leadership will enable movements to develop?' He understood that multiplication requires simplification and this will be covered in detail in a new book not yet released, 'Church 3.0'. He mentioned 'Church Multiplication Associates' (CMA). We'd really like to multiply but often we only add. We're really good at subtraction, taking people from an existing group to add them to our own) and we're also pretty good at division (we are easily offended). How can we handle big numbers of new believers? Ten or a hundred we can manage, but how would we cope with a million? The church needs to be self-perpetuating and self-propagating. It begins witth transformed disciples and ends with transformed churches and even movements. The Bible never tells us to plant churches, it tells us to make disciples. Jesus himself will build his church. Chain networks and hub networks are the two kinds that we are concerned with, and they have different strengths and weaknesses. Neil doesn't say that one is right and the other wrong, just that they are different. Chains can reproduce fast and have a global impact. He also spoke about the different kinds of groups that work in the church (and in other aspects of human society). Groups of 2 or 3 are the best for intimacy and real, depp friendship. 12 to 15 are typical of family groups and house churches. They bring in more diversity. 25 to 75 are good for training, for mission, and for regional leadership equipping. 120 - 150 (12 to 15 small churches) are really the relational maximum that a person can deal with, a simple church network is a good example of this. 300 to 500 is good for a conference or some kind of special gathering. And the multitude is impersonal but can be good for teaching content and for healing. Larger groups can be composed of groupings of the smaller units. Jesus used groups of all these sizes, each where appropriate. Neil suggests we start building groups of two or three and then let these assemble into the larger entities. John, Tod and Kent are part of the small team that manages the LK10 community of practice website. Tod began by describing SASHET (Sad Angry Scared Happy Excited Tender). Originally designed as a method of therapy, Tod and others have adopted the principles to form a simple technique, easily learned and easily passed on. It helps a small group of people communicate to one another how they feel and can open up a deeper discussion once they understand one another from going through the SASHET exercise. We tried this out by dividing into groups of four, and listened as each one spoke about any of these feelings in their hearts right now. We found it brought us together and helped team building. Some people found it cleared the decks in the sense that once these things have been aired, it becomes possible to set them on one side and move forward. It helped us accept one another as we truly are, one person summed it up by saying, 'It helps us be human beings rather than human doings'. John White pointed out that in Matthew 10 the disciples are listed, not singly but in pairs. It's easy not to notice this. He also later sent them out in pairs. So it seems Jesus has a 'church of twelve' around him, but the group was made up of a collection of 'churches of two' (CO2). There are considerable advantages to groups of two and they are noted in the Bible. Two are better than one, we stand together. Two is also the smallest possible expression of church. With two we can encourage one another. Kent described how this can work in practice and pointed out that a CO2 can be a husband and wife, two friends, parent and child. And it's not exclusive. In other words a person can be in more than one CO2 at any particular point in time. It works best if there's an intention to share together daily, even if it's just by phone. A larger group, a house church for example, cannot hope to meet daily. The first session of this year's House2House Pre-Conference was interesting and raised a lot of questions. It was led by Tony Dale and he began by demonstrating with a show of hands that perhaps 10 or 15 percent of those in the room were from megachurch or medium size church organisations, with one or two in mission work and the remainder house church people. We watched Seth Godin's video from the TED Conference, you can view it yourself below. The pre-reading for the House2House network leaders meeting was Seth Godin's book 'Tribes' in which he goes into much more detail. With this to set the scene, Tony led us through a series of thoughts based on Seth's analysis of what a leader does. He referred to Romans 15:18-21, Paul felt what Seth describes as 'I can't stand the status quo'. Here are one or two of the key thoughts. We need to be heretics. Jesus was a heretic. He had a lot of trouble with the establishment of his day. We change things by telling a new story, people are waiting for something new, we need to connect people who share the same vision. Jesus did all these things. Here are some quotes from Seth's book. Heretics are the new leaders, they get out in front of their tribes. It's more fun to make the rules than to follow them! It's profitable, powerful, and productive to make change. Managers make widgets, leaders make change. Great leaders embrace deviants by catching them doing something right. Growth doesn't come from persuading the most loyal members of other tribes. Tearing others down is never as helpful to your movement as building your members up. We then did a number of exercises in small groups, testing some ideas out and commenting on them. Why wouldn't we do things the way Jesus did them? Should we focus on the masses or on the ones who stick out as different? Ho hum, I'm in the USA. Food comes in larger quantities than I'm used to! Last night I felt peckish, not hungry enough for a full meal, I just wanted a light snack. The hotel offers these in an area with comfortable seating and low tables around the TV between the dining room and the lobby. I ordered pita chips with houmous and olive paste - just a light snack. I was served a very nicely presented dish containing enough pita chips for four people (I kid you not!) and as much houmous as you'd expect to put on the table back home for six. It was delicious but it was not a snack, not in my terms at least! Nor was it healthy eating, too much salt in the chip coating and too much deep-fry oil - but very tasty. I didn't finish my 'snack' although I made a pretty good attempt. I'm still not hungry this morning. Grand to be in Dallas, though. I'll take a stroll in the morning semi-cool and spend the day relaxing and getting organised for this evening's pre-conference session. I didn't take a photo of the pita chips, so I've included one of the Dallas sunrise instead. 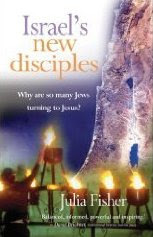 This is the title of Julia Fisher's latest book, the subtitle is 'Why are so many Jews turning to Jesus?' . It's a very good question! Julia provides some intriguing answers in the book by publishing edited interviews with a number of key people living and working in Israel. Although I haven't yet finished the book I want to draw attention to a couple of brief mentions that struck me as particularly significant. I see, alongside the traditional congregational structure, a growing number of smaller groups of believers with a greater focus on community living. And secondly, on page 79 she refers to Islamic Indonesian followers of Isa actually praying for Israel and a real need for believers in the West to get more involved in prayer and interaction with Messianic Jews. These two factors mesh amazingly well with things I've been watching elsewhere. Namely the growing trend in the West to meet at home informally and become more involved in practical ways of real community living, and the trend reported by Wolfgang Simson of rapid growth of small, close-knit groups of new believers in Asia. We live in very exciting days! By the way, I strongly recommend anyone interested in events in Israel to read Julia Fisher's other books, 'Israel - the Mystery of Peace' and 'A Future for Israel? '.